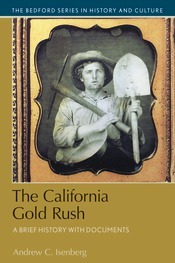 The story of the California Gold Rush is one of unanticipated, rapid, and momentous change. In 1848, California was a remote and underpopulated province of Mexico; by 1850 it had become part of the United States and produced one-third of the gold in the world. Popularly, the Gold Rush is remembered as a pleasant adventure in which many prospectors not only became wealthy but furthered national expansion. Yet few prospectors struck it rich, the Gold Rush was characterized by appalling violence, and the environmental consequences of mining were devastating. In this volume, Andrew C. Isenberg confronts these controversies and paradoxes directly. The collection focuses on the social and environmental context and consequences of the Gold Rush, and considers, in the final section, whether the popular memory and scholarly understanding of the Gold Rush reflect that context and those consequences. A Chronology, Questions for Consideration, maps, and a Selected Bibliography all enrich students' understanding of the California Gold Rush.